The City College Black Knights scored 22 unanswered points to erase a 12-point deficit to beat the Poly Engineers, 22-12, giving City College bragging rights in one of the greatest and longest high school football rivalry’s in the country. 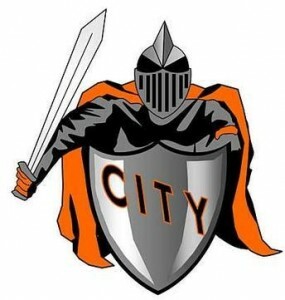 City and Poly have faced off 126 times, with Poly leading the rivalry with a 62-58-6 (wins-losses-ties) record. Yet it’s City that has gotten the best of its archrival in recent years, beating Poly in each of the last three face-offs. Poly had threatened to end City’s streak after jumping out to a 12-0 lead in the third quarter – Poly senior receiver/running-back/cornerback Marquis Coleman ran back the second-half opening kickoff nearly 80 yards for a touchdown, pushing his team to the two-score lead. But that would be the last time Poly scored as the Black Knights clamped down on defense and scored back-to-back touchdowns – both scored by senior quarterback Na’Shon Godfrey – to take a 16-12 lead before the third quarter could end. Pressing to get their offense going in the fourth quarter, Poly forced a pass down field and was intercepted by City senior receiver/defensive back Julius Harvey, setting up a long touchdown run by junior running back Michael Welborn Jr. The touchdown run extended City’s lead to 22-12 with just minutes left in the game, putting a nail in the coffin on Poly’s chances of retaking the lead. The win pushed City College to a 5-5 overall record and advanced them to the Maryland Class 3A East regional playoffs. Poly ends its season with a 3-7 overall record.